La-Z-Boy Recliners or “Lazy Boy” Recliners are known for their world-famous comfort and unique design. However, most people aren’t aware of all the exclusive features and benefits you’ll only find on an authentic La-Z-Boy Recliner. At La-Z-Boy Home Furnishings & Décor, we love bringing comfort to people’s lives by fitting them in a recliner that’s perfect for their unique body type. Plus, reclining with your feet above heart level has many rejuvenating health benefits. That’s why we put together this guide with everything you need to know about La-Z-Boy Recliners. 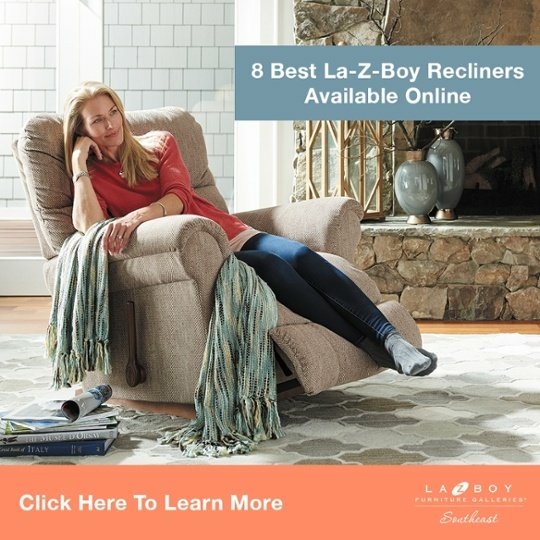 Where Are La-Z-Boy Recliners Made? 1) Where Are La-Z-Boy Recliners Made? La-Z-Boy Recliners are proudly made in America and have been since they were invented. When you purchase a La-Z-Boy Recliner, you’re supporting your local community and economy. When the recession hit in 2008, many companies took their business overseas. La-Z-Boy did the opposite and took steps to ensure their manufacturing stayed in the United States. In 1927, cousins Edward M. Knabusch and Edwin J. Shoemaker set out to design a chair for what they called “nature’s way of relaxing” with a few orange crates to mock-up their idea. They invented a wood-slat porch chair with a reclining mechanism. It was a massive success. A contest was held to name the chair, and a twelve-year-old girl observed, “You guys look like a bunch of lazy boys sitting in those chairs.” Lazy Boy was deemed the winner and the name was later fashioned into La-Z-Boy. In 1961, the La-Z-Boy Recliner was updated to include a footrest. A few years later, La-Z-Boy expanded in to sofas, chairs, and other furniture. Today, La-Z-Boy is traded on the New York Stock Exchange under the ticker symbol LZB. The La-Z-Boy World Headquarters is located in Monroe, MI. This is the same small town where our founders invented the La-Z-Boy Recliner years ago. La-Z-Boy Recliners are known around the world for their famous comfort and design. However, most people haven’t heard about the exclusive features and benefits you’ll only find on an authentic La-Z-Boy. La-Z-Boy has a patented reclining system capable of providing complete body and lower back support in every position. When you recline in a La-Z-Boy Recliner, the back and seat move together so a gap doesn’t develop between your lower back and the seat. In other recliners, a gap will develop near your lower back because the back and seat aren’t attached. This leads to people stuffing a towel or pillow underneath their back to make up for the lack of lumbar support. Reclining with a gap between your seat and lower back will lead to back pain and other health issues. La-Z-Boy is the only recliner that prevents back pain by supporting your lower back in every reclining position. When you ride in an airplane, the first thing most people do is recline the seat a few inches. This helps you relax during the flight because your back is at a comfortable angle. The same idea goes for recliners. La-Z-Boy has a patented mechanism that allows you to recline your back without having to put your feet up. This is something no other recliner can do. Sitting in a La-Z-Boy is much more comfortable because it’s the only recliner that can recline your back without having to put your feet up. While working on your laptop, you may not want to recline your feet up all the way. Or you might have company over and don’t want to recline completely back while you socialize. La-Z-Boy’s patented locking footrest allows you to angle your feet in three different positions depending on what the situation calls for. La-Z-Boy is the only recliner that allows you to adjust your footrest in three locking positions for greater comfort. When you recline in a La-Z-Boy, you’ll notice a clicking sound as you rock through the different locking positions. This “sound of comfort” is a patented feature that lets you lock-in the rocker position of your choice. La-Z-Boy Recliners have 16 different locking positions you can cycle through until you find the position that fits you best. This is another feature you’ll only find at La-Z-Boy. Rocking back to where your feet are above heart level has many health benefits. This gets blood moving in the opposite direction of gravity, which is important for heart health. Most people will push on the arms of their recliner when it’s time to get up. This will cause the frame to expand apart on other recliners because their frame is only two or three sided. When you turn a La-Z-Boy Recliner upside down, you’ll notice the frame is built out of American maple hardwood and oriented strand board (OSB). OSB has been used in the flooring and roofing of most buildings since 1977. It’s also 11% stronger than plywood. This strong & environmentally-friendly material is used to reinforce the frame on all four sides of La-Z-Boy Recliners. This is why your La-Z-Boy Recliner will be passed down from generation to generation and become a part of your family. If your children or pets are playing underneath your La-Z-Boy Recliner, you won’t have to worry about the footrest suddenly collapsing. La-Z-Boy Footrests are sturdy and built with a patented dual locking mechanism. So the footrest will only go down when you want it to. Footrests on other recliners aren’t built the same. Some can be pushed down with light pressure and have no way to lock in place once they are reclined. Meaning they can fall at any time. La-Z-Boy’s dual locking footrest prevents accidents from happening. La-Z-Boy uses a solid block of contour cut foam in all of their recliners. Other recliners are often filled with some form of stuffing. Using contour cut foam in recliners is another patented feature you will only find at La-Z-Boy. This keeps your recliner looking nice and keeping shape longer than other recliners. Picking a recliner is a lot like getting fitted for a shoe except we focus on your whole body instead of just your feet. Recliners are built to fit certain body types better than others. If you pick a recliner that doesn’t fit your body, you may experience aches and pains after sitting in it for a while. Purchasing a recliner that fits your unique body type ensures you will get the most comfort out of your new chair. Getting fitted for a recliner at your local La-Z-Boy Home Furnishings & Décor will prevent unnecessary pain. And it will ensure you get the maximum comfort out of your new chair. The first thing your design consultant will look at is your height. 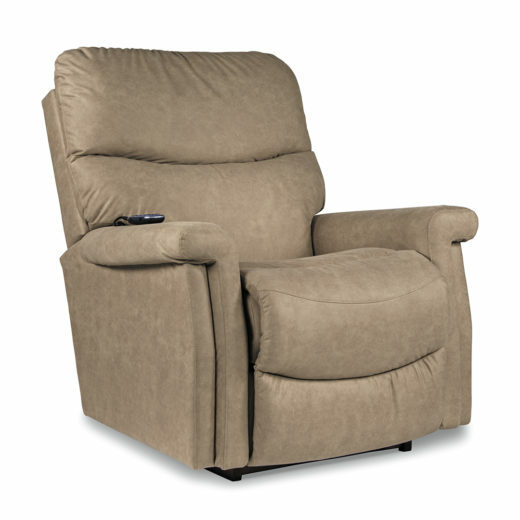 La-Z-Boy Recliners come in a wide range of sizes for people of different heights. La-Z-Boy Recliners come in a variety of styles and over 900 different leathers and fabrics. 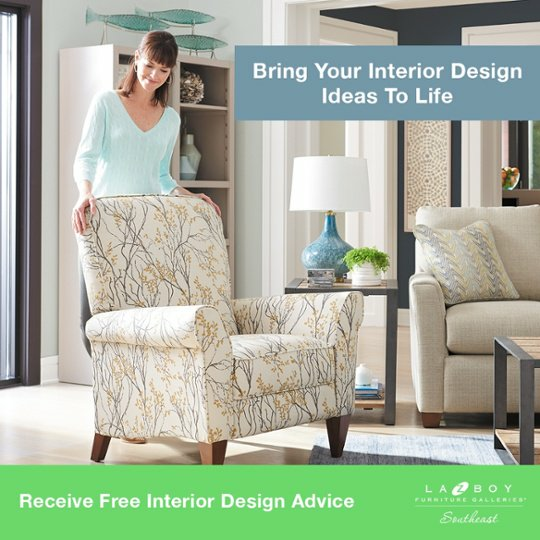 If you feel overwhelmed by this large number of fabric options, it’s ok.
At your La-Z-Boy Furniture Store, you can meet with a degreed interior designer for free and they’ll help you pick the perfect fabric option for your home. Click here to download our Free Guide: 3 Steps to Finding the Perfect Recliner! It turns out there’s a reason you feel so great after a nap in your recliner. Some people have even decided to ditch their mattress and sleep in their recliner full-time to reap the positive health benefits. In the video and list below, you can learn more about the health benefits of sleeping in a La-Z-Boy Recliner. There’s a scientific explanation for why it feels so good to kick your feet up at the end of a long day. Sitting at your desk or standing for long periods of time causes blood to rush to your legs and feet. You can give your lower body some relief by elevating your feet above heart level. This allows gravity to naturally reduce stress and inflammation. Reclining your legs and feet jumpstarts your body’s circulation and helps you recover from daily fatigue. Plus, it’s great for your back. Back pain is a common ailment that will likely happen to everyone at some point in their life. Our back and core muscles are constantly at work balancing our upper and lower bodies throughout the day. We can take this pressure off our back by reclining and elevating our feet. This gives our overworked core muscles a chance to relax and recover. Elevating your feet also lets gravity send blood to the muscles and tendons of your lower back. This helps our backs heal and become stronger. Sleeping in your recliner can treat and prevent lower back pain by resting your muscles and giving them the ability to stay healthy. Sleeping in your recliner opens up your diaphragm and helps you breathe easier. Sufferers of heartburn, acid reflux, and GERD find relief in their recliner because sleeping in an upright position allows gravity to keep stomach acid down. This will also help you get a full night’s sleep. Elevating your feet improves circulation, relieves back pain, and helps you breathe easier. Plus, it has positive effects on your nervous system. Your nerves are constantly firing and working to move your body and get things done. By reclining and giving your body a chance to heal, you’re also giving your nervous system a much-needed break. You can benefit from a quieter and clearer mind by giving your nervous system time to relax. Taking some slow and deep breaths while you recline will put your body in “rest and digest” mode. In this state, your body will actively digest anything you’ve eaten while working to heal and repair your body. This allows your digestive system to fully process your food. Letting your body rest and digest before bed leads to an improved overall quality of sleep. 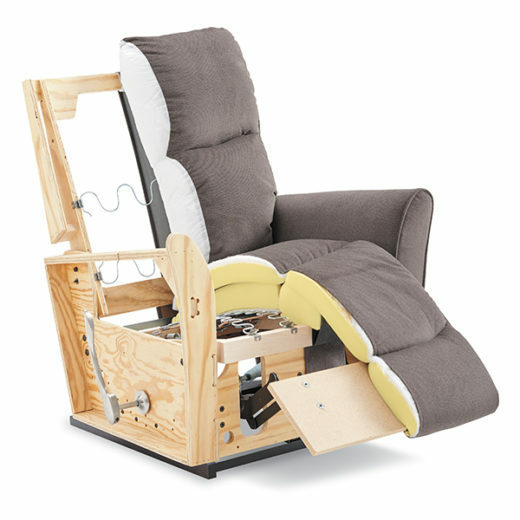 Removing the back of your La-Z-Boy Recliner makes moving a lot easier and also gives you an opportunity to perform simple maintenance. Installation and removal of the recliner back can be done by yourself or with the help of a friend. All you’ll need is a flat/slotted screwdriver. If you run into trouble, simply contact your local La-Z-Boy Home Furnishings & Décor for more assistance. The brackets on the back of your La-Z-Boy Recliner can get loose over time. While the back is off, tighten the screws on both brackets to make the back more secure. You can also tighten the exposed screws on the brackets of the body. These are the brackets that keep the back in place. Tightening these screws keeps your La-Z-Boy Recliner Back from wobbling back and forth. After these screws are tightened, you’re ready to put your La-Z-Boy Recliner back together. La-Z-Boy also offers a limited selection of their recliners on Amazon and Wayfair. However, these recliners come in a limited amount of fabrics and aren’t available with any upgrades or options. Keep in mind – sitting in a recliner that doesn’t fit your body type will cause unnecessary pain. This is why it’s important to spend time relaxing in your new recliner before you buy it. Whether you’re searching for just a recliner or to redo your whole living room, you can get a great deal on furniture every day of the year. Most furniture companies run year-round promotions. This means you can get a fair price on furniture every day of the year by taking advantage of these promotions. You’ll notice most advertisements for promotions are run around the holidays. However, many furniture stores have a promotion running even if it isn’t advertised. La-Z-Boy Recliners have a lot of moving parts and will go through a lot of wear and tear in their lifetime. Thankfully, the mechanisms and frame are covered (for varying amounts of time) with La-Z-Boy’s Limited Warranty. If something breaks on your La-Z-Boy Recliner, contact Customer Care at 1-855-802-6636 or by submitting this contact form on their website. La-Z-Boy Recliners are very comfortable pieces of furniture. However, it can be difficult to style around your recliner because their one-of-a-kind design stands out so much. Thankfully, you can use these simple interior design tips to help your recliner blend into the rest of your room. When someone walks into your room, their eyes will be drawn to the patterns first. This is because exciting patterns naturally grab our attention. Putting your recliner in any solid color will keep guests from noticing it the moment they walk into the room. This color can be bright or neutral, but it’s best to avoid patterns. You can incorporate patterns into your rugs, pillows, and other accessories to take attention away from your bigger pieces of furniture. Designing the layout of your room so the recliner is in a corner helps camouflage the bulkiness of the chair. Most recliners can be positioned to where they can fully recline and still fit in the corner of your room. If you’re having trouble finding a recliner that can fully extend in the corner of your room, then you should take a look at La-Z-Boy Wall Recliners. These recliners have a patented feature that allows them to fully recline with only a few inches of space behind them. The corner of the room is a natural place for your recliner to fit. But what if the corner of your room isn’t an option? If your recliner is floating in the middle of the room, you can offset the bulky design by adding tables, lamps, and accessories next to it. This connects your recliner with the rest of the room. When big pieces of furniture don’t have anything around them, they will look out of place. Adding side tables along with accessories will bring everything in the room together. You can seamlessly link your recliner with the rest of the furniture in your room by offsetting it with tables, lamps, and accessories. Another reclining option is picking a push back or high leg recliner in place of a classic La-Z-Boy Recliner. High leg recliners have a modern style and also give you the ability to push back and recline your feet. These gorgeous recliners look great in a wide variety of colors and patterns. Putting your sofa in a neutral color gives you the option to pick a fun and exciting pattern for your high leg recliner. If you like this style, you should take a look at the La-Z-Boy Riley High Leg Recliner (Pictured) or the La-Z-Boy Fletcher High Leg Recliner and browse through their wide range of custom fabrics. Styling your recliner can be tricky. However, these tips will help you camouflage your recliner and bring the room together. 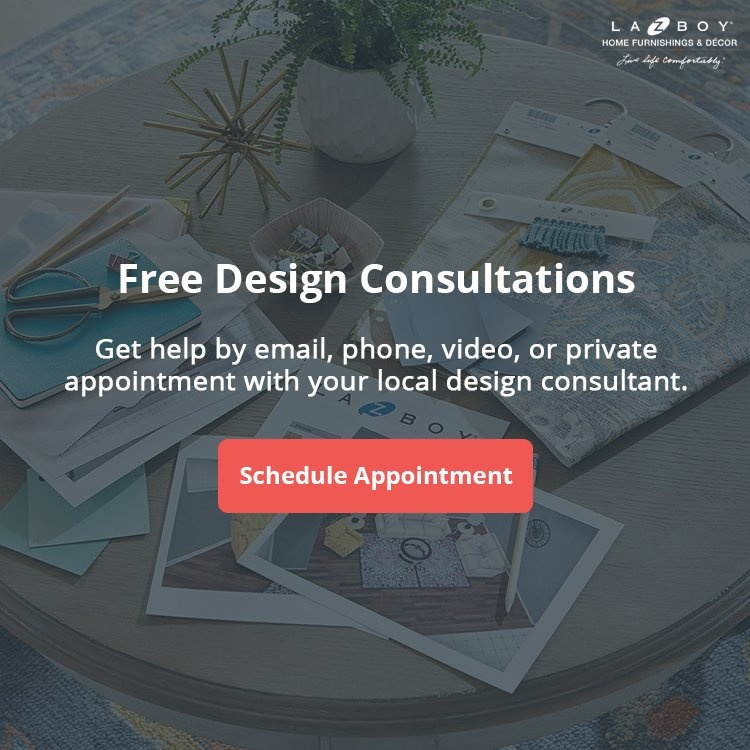 If you’d like some more help designing around your recliner, you can visit your local La-Z-Boy Home Furnishings & Décor and meet with a degreed interior designer for free. Your personal interior designer would be happy to help you design around your recliner and bring your ideas to life.